It’s time for another TOS Review Crew Review. Today’s Review Crew product covers math drills. Designed to help students master their math facts for the four basic operations, MathRider takes children on a noble horse riding quest through the “magical MathLands” that leads to the rescue of the princess and knighthood as Master of Mathematics. Age: approximately 3rd-6th grades though can be used with younger and older students. Using MathRider with Supergirl: Developmentally, Supergirl is just outside the range for this program. I had hoped to be able to use this with her to at least work on some of her addition and multiplication facts but since I only had this program for a limited time, it didn’t seem worth the effort to work with her to utilize this program. She did ask if she could play, but after letting her try, I could clearly see she needed more assistance. I believe she would have enjoyed the program; I think over time it would have been good for her but our license expires at the end of February. The game play page states: “The four quests are the same across the four operations, however, the rewards are not. Every combination of quest and reward holds a different reward.” I think this statement is misleading. For example the reward for the easy level is a flower and that flower is the same for each operation. The reward for the medium level is a gem. The gem colors do vary based on operation but I don’t really consider that a different reward. If your student is motivated by unique rewards, this may be disappointing. What I liked: I liked the background music that plays while you do the ride. I found it relaxing. I liked the backgrounds during the ride. I liked that if you missed a problem you would see that problem again and again. I loved that you could do practice runs and that you could control which set of facts to practice during the run. I liked that during the practice runs you could choose a timed version or a pole jump version. I liked the option of turning off the reading of the story and manually moving to the next scene. After hearing it read to me once I didn’t need to hear it again 3 more times for the other operations. I liked that it required mastery for the 10’s 11’s and 12’s for multiplication. I liked how the the Mastery Level Reward built upon previous mastery levels. I liked that I didn’t get 4 castles but rather that each level added to my one castle. What I didn’t like: I didn’t like that that there was only ONE story line per level and that the story line didn’t change from operation to operation. If you were saving mom in addition you were also saving mom in all three of the other operations. I didn’t like the poor quality of the graphics for the story/quest. I didn’t like that some math facts would only show up ONCE in all the rides I did but some math facts showed up over and over and over again (and I don’t mean the ones that were answered wrong). There didn’t seem to be enough randomness to the questions. I didn’t like that it requires mastery of the 11’s and 12’s for addition and subtraction. Final Thoughts: Although I think this product could be a good fit for some children, it was not a good fit for my family. Tailorbear experienced frustration when trying to complete the addition and subtraction quest for mastery because I do not require mastery of the 11’s and 12’s for those two operations. Supergirl was not quite ready for it; BooBear wasn’t interested. I think this program is a good fit for children with active imaginations who are self-motivated. I don’t think it is as good a fit for those children who are motivated by rewards and strong story lines. For detailed information about the game including videos and screen shots please see these webpages: MathRIder Home, Game Play, FAQ. Click on the banner below to read what my fellow crewmates have to say about MathRider. Disclaimer: As a TOS Crew member, I received a fully functional but limited time version of Math Rider to review. This review is my honest opinion with, hopefully, enough detail as to why I liked or did not like a product so that my readers can make an informed decision. I received no compensation. All across the country, people have been celebrating love today. Children have exchanged valentines in school. Some husbands have brought home flowers or have made romantic plans for their wives. We really haven’t done much with Valentine’s Day today. I’m not making a special dinner. My husband didn’t even get me a card. I think one of my girls said Happy Valentine’s Day. We did some cleaning. We did some school. Dinner is simmering on the stove. But today, in my heart I hold two things close. February 14 is CHD Awareness Day. Congenital Heart Defects affects 1 out of every 100 babies. It is *the* most common birth defect. As the mother of a “heart baby” February 14 will always be the day set aside to remember all the CHD babies. Here’s a picture of my HLHS Survior. Supergirl will be 13 years post Fontan in May. I find it hard to believe how far we have come. It’s been a difficult road, not just medically but in all aspects of her development. She is quite the challege to parent! There is another reason I hold today so dear. February 14 is the anniversary of my chrismation. On this day, 1 year ago, I became an Orthodox Christian. First I took part in an Office of Reception after Saturday Vespers on February 13, 2010. My family was baptized Sunday morning and all of us were chrismated. Here is a picture from the first service..
My girls are getting an incredible education here at home but I wouldn’t be able to do it without the support and involvement of Honeybear. So just what does he do? He listens. Sometimes I just need to talk through what I am trying to accomplish. By telling him what’s working and what’s not working, I can figure out what needs to change in our curriculum plan. He reads. About 8 years ago he took over reading the read alouds in the evening before bed. We use Sonlight for history and literature. I would read the history during the day and at night he would read the “read aloud” to all of us. We all have wonderful fond memories of daddy reading while we’re all snuggled together in the living room listening. As we added multiple “Cores” to our day, we would take turns reading at night. He’d read a chapter or two from one book and then I read a chapter or two from another book. Sometimes we’d alternate nights with one of us reading a couple of days assignments and the next night the other one reading two days worth from the other book. When I had several history programs to read aloud, he helped by reading those as well. This year he is reading some of TailorBear’s history. He actually *asked* if he could please read the Usborne World Wars book. He leads. We are a talkative family. He leads discussions about current events or topics they are currently studying. It can get interesting around here. I’ve lost track of the number of times I’ve walked into a room to hear some sort of discussion about history that he has started. He encourages. Many times I have wanted to quit. He encourages me to keep going. When one of the girls says “I can’t”. He tells them, yes you can. I know you can. He’s not the only one who has helped out with school. Now that the girls are older, they have been involved with helping me as well. While I work out algebra equations with Turtlegirl, Tailorbear or BooBear will read a book to Supergirl. While I discuss “dress ups” in the English paper with Tailorbear, Turtlegirl helps Supergirl explore addition. You get the idea. 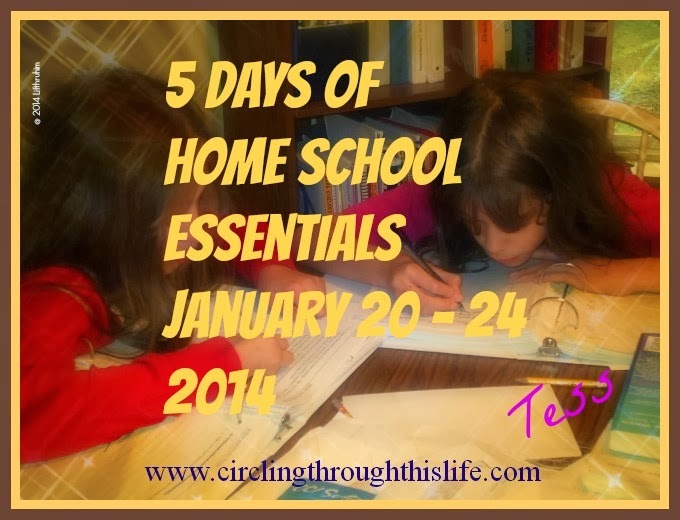 For us, home schooling is a family affair with everyone doing their part to ensure we are all well educated. We’ve been having fun around here learning about something rather curious: Red Tides. I’d heard of them but really didn’t know anything about them. My 15 year old excitedly defined red tides for her sisters creating excitement among all of us. Red Tides is just one of the titles in the Curiosity Files series of unit studies published by the Old Schoolhouse. To get them thinking creatively and give their minds some exercise. I like these goals. I want my children to learn about subjects that they’d never find otherwise and I wholeheartedly want them to be thinking creatively and exercising their minds. The Curiosity File starts with the information section. I love the title: “Everything You Never Wanted to Know about Red Tides”. Because it is written in question and answer format, I couldn’t resist pretending the girls were asking the questions and I had the answers. Sometimes I would just read the question and respond with “that’s a very good question Tailorbear” ; sometimes I would start a section with “Supergirl wants to know” and then I would read the question and answer. The girls would giggle when I added their name to the question or to the response. Figure it Out covers math topics. The Curiosity Fact Files—”These curiosity snippets” are mini-booklets. Some home educators refer to these as lapbooks. Templates for storage folder are included. My thoughts: We chose to do this as a group. Supergirl sometimes hung out with us and at other times she wandered away. As a first grader, I could have made this work for her but I chose to focus on the 6th, 8th, and 10th graders. I think this would be ideal for 4th to 6th grade. I found it easily adaptable to do with 8th and 10th graders. I appreciated having two word lists (one for younger students and one for older students)for vocabulary and spelling. We read through the list together and then the girls completed an activity page that taught us the meaning of each word and they were fun. What I wish the study had: I am not really a unit study kind of mom. I enjoy studying one topic such as red tides and covering multiple subjects. However, I really need more structure than what is provided. I would have loved some type of explanation of how to use some of the sections. I really wanted a suggestion of how to break up the activities to schedule our day. It was difficult for me to start the study because I didn’t know where to start or how to proceed. I’d love to see a chart or suggestions of how to schedule the material. Should we read through all the info section first? When should we complete the “Let’s See How Much You’ve Learned” section? Should we do it in one sitting? Not knowing what to do with some sections and not having any clue about how to schedule the study, frustrated me. I’m sure that many moms who are more familiar with and prefer unit studies understand better than I how to schedule but for moms like me who need more structure, I hope that future Curiosity Files include more guidance for how to use a unit study. Having completed the sections that seemed easiest for me to schedule and that interested my children the most, I am very thankful that we stuck with it. The information is solid and well-written. The presentation is beautiful. The “Everything You Never Wanted to Know Section” is worth reading and adding to your science curriculum even if you are not a unit study type of person. I think these are wonderful mini-unit studies and I think taking a break for a week or two from “regular” school and completing a Curiosity File would be a great way to break up the monotony of winter. Having completed one, I feel like I could try doing another (but I’d really like scheduling suggestions!) and even if I don’t use them as unit studies, I’m considering adding more into our school. I will be using Red Tides again in the future with Supergirl and I am particularly interested in the Blue Diamond and Blue Footed Boobies for all of us. There are many that focus on insects so a budding entymologist would have a blast exercising his (or her) brain and thinking creatively. There are currently 9 studies available for the Curiosity Files with more planned for the future. All 9 studies can be purchased as a bundle on CD here for $49.00 or as an e-book here for $46.00. Click here for individual titles (prices on individual titles are subject to change). If you like the Curiosity Files series from TOS, you might also like their WeE-book and WannaBe series. Many of my crewmates reviewed other titles in the Curiosity Files series. Please click on the banner below to read what they have to say. I love poetry. I think I was in the 4th grade (or maybe it was the 5th)when I began to love poetry. I had a teacher who required us to write a poem. She worked with us and helped us to polish our little poems. My poem was published! I actually got paid $5 from one newspaper and $5 from another newspaper and it was part of the district wide poetry book. My grandmother even got it published in her town paper. That summer my grandmother gave me a spiral bound notebook and told me to write. Her advice was to write daily. Somewhere, buried under this and that, I think I still have that notebook. What silly little things I wrote but oh the memories of showing my work to Grandma. In 9th grade, I had a teacher who loved literature and she taught me how to love literature. She introduced me to Shakespeare and Dickens and the poetry of Robert Frost. I would *never* have admitted to *any* of my classmates just how much I loved that class. I really want to share Robert Frost’s “The Road Not Taken” but I can’t get it to format correctly. Turtlegirl and I have been discussing this poem and why it is my favorite as part of her 9th grade LA class. I pointed out that for me “all the difference” in the path I chose means that I have BooBear, Supergirl, Turtlegirl and TailorBear. Had I chosen a different path I would not have them. It has made all the difference to me! *** Payday for the first payday of the month is a wonderful thing. Payday for the second check of the month is a stressful event. Thankful that this week is payday of the wonderful kind. Now to budget it so that the end of the month is not so stressful! ****Developmental milestones for Supergirl are a mixed blessing. Today I caught her standing on a regular chair at the computer desk hunting for CD-ROM on the top of the hutch part of the desk. Two thoughts ran through my head: Intertwined with “Wow! She’s no longer afraid to climb things what a huge leap in development” was “Oh no! Nothing is safe anymore. Nothing will be out of her reach”. Really, it was thrilling to see her becoming independent enough and strong enough and clever enough to be able to climb up on the chair and STAND but it was also a horrible thing to realize that I can no longer put things up on top of that hutch. ****Just because the menu plan said “soup” doesn’t mean I have to follow it. I know that should be “duh” kind of thing but I was so hung up on Soup on Wednesday that I was in a panic when I had no fresh bread to serve with it. Then the lightbulb switched on and I went “Um, why don’t we switch things around have soup on Friday when Tailorbear can make more bread. *****For the sake of my sanity, it really is better if I leave the kitchen when the girls are cooking. They need to learn and I hover way too much. Tailorbear made a batch of bread earlier this week and it turned out fine. She didn’t burn the kitchen down and she didn’t really need me. ******CD player in the Van is a wonderful luxury. It is so wonderful to be able to listen to audio books on CD from the library as we go to and from piano lessons. Last week we finished up Cheaper by the Dozen and today we started Caddie Woodlawn. Time to go make dinner (NOT soup LOL). What’s been on your mind? Virtual Nerd has announced a special offer to home educators on their 1 month and 3 month subscription service . The regular price for a 1 month subscription is $49. A three month subscription is $129. Click here to sign up! And don’t for to enter the discount code: homeschooldeal to get 50%! I’d love to hear from you if you take advantage of the promo deal! Just leave me a comment and let me know you signed up! Are you looking for a fun way to increase your student’s vocabulary? Perhaps you have a high school student preparing for the SAT and you need something for vocabulary review? VocabAhead may be what you need! As a member of the Old Schoolhouse Homeschool Crew, I received a DVD-Rom from VocabAhead to review. This DVD-ROM contains over 1,000 “videos” and MP3 files. For the video files: the visual portion shows a definition of the word and then shows a cartoon depicting the word while the sound includes the definition along with either a few sentences providing context for the word or a short narrative story using the word. The MP3 files allow you to take your learning “on the go” and can be played on your computer or uploaded to your iPod. These files contain the same sound as the video files. VocabAhead DVD retails for $24.99. If you click on DVD Product on the VocabAhead website (click here), it will give you a link to Amazon to purchase the DVD. Here is one of my favorite words from the DVD-ROM. The narration for this verb tells a story. The boy just dabbles at his work because he’d rather be off playing ball with his friends. The story is entertaining but the definition sticks. All of us have enjoyed learning vocabulary with VocabAhead. TailorBear, age 11, said “it’s fun. I like the stories.” We’ve used this DVD-ROM in two ways. 2) 3 to 4 times a week we gather around the computer and watch 5 videos. We’ve been taking the first 5 words of each letter of the alphabet. When we make it through letter Z, we’ll go back to the top with A and go through the alphabet again with the next 5 words. We try to find ways to incorporate the new words into our conversation. In addition to the DVD-ROM, VocabAhead also offers a book and an iPod application. The website is a rich and valuable resource for vocabulary prep for the SAT. I really appreciate the DVD-ROM though because with it, I get more words than what is available in the study room and more importantly with the DVD-ROM I am not dependent on the internet. Click on the banner below to read what my fellow Crewmates have to say about VocabAhead. I’ve posted before about Meal Planning and challenging myself to use what I have. I’ve learned that necessity really is the mother of invention and that so long as I didn’t really *have to* get creative I would avoid exercising my brain and fail to really use up what I have on hand. I would justify those little things like “oh I really need a can of mushrooms to make this recipe so I’ll pick up a can of mushrooms. With less money coming in and more money going out, I have less available to purchase groceries. I actually went two weeks without going to the grocery store. Yes I usually shop once a week and sometimes in between those weekly stops, my honeybear would stop for me to get that “one little thing” that I had forgotten that I just simply had to have to make a particular recipe. Guess what? This week, when I had NO mushrooms, I still made the recipe! I just didn’t include mushrooms. I did have celery and bell peppers (neither of which the recipe called for) and I used those and it was GOOD. But we were so close to the end of the week. We knew we would be buying milk and a few other groceries so we decided that we would find *something* that didn’t require milk for breakfast. It will be much easier to go one week, instead of two with NO trips to the grocery store. I suspect that I’ll still have to get creative but I’m thankful that I was able to replenish some supplies! onions--- a nice way to add flavor! potatoes--- having these on hands opens up so many possibilities for meals! cheese—I prefer having both cheddar and mozzarella… I have some of both this week! milk (I’m thinking I need to pick some powdered milk up for the pantry for those times when I run out of milk but can’t go to the store. I am sitting very well this week, even if I don’t have my “favorites”. Not only will my family NOT go hungry, I think we’ll actually have some great meals! What are some of your “need to have on hand” items? If you couldn’t get to the store for a week, would you be able to feed your family? When I started this blog, I wanted it be a way for me to pass things to my children. Things like recipes or memories or stories to share. One of the things I want to remember and pass on are those misstatements and funny word mix-ups. So here is a short collection of things as I remember them. A couple are more recent, a few are several years old. 1). Rootbeard---- Mommy, can we have more rootbeard to drink please. 2) Deheaded--- Mommy, Marie Antoinette was deheaded. 3) Insociable--- [to her sister] stop being so Insociable and come on out here. I know that I have already forgotten so many of the cute things they said when they were little (and not so little LOL). What cute or funny or misspoken thing has your child said that still brings a smile to your heart? Every now and again the Review Crew gets to review a really fun product. Roman Town from Dig It Games is one such product. This is a computer game but lest you think it’s all fun and games let me reassure you this product is designed to educate. With Roman Town you will learn while you play. Before I share some details of how the game works, I’d like to share my thoughts and I have a CODE to share with you for a really great deal on this game. The current retail price of Roman Town By Dig-It Games is $39.95 but if you enter the code TOS2011 you will get a discount that brings the game price to $19.95! This offer is valid until February 21st. Click here to purchase. All four of my girls have really enjoyed Roman Town from Dig-It Games. My 15 year old, is interested in setting up her own player but hasn’t gotten around to it yet (She’s been playing with Supergirl doing the reading for her) I would like to point out a couple of things I noticed about the game and then I’ll share how the game works. I wish that you could skip the intro and go straight to the sign in screen but you must click through all of the Intro storyline first. I wish there was an option for the game to read the text to the student. Supergirl loves Roman Town but she must have someone read all the text to her. She can play many parts of it independently but she would miss out on the educational pieces. I found it a little boring after a while to click on the diggers and then uncover the artifacts but my archeology loving 13 year old did not and my Supergirl loved doing that part. My 11 year didn’t mind the digger part but she said she found it boring when some of the LEARN pages were exactly the same. You can only have up to 5 player names at a time. You can delete players so that new players can be added. I know I just wrote some things that appear rather negative, but I really do love this game. We are planning to study Ancient Rome sometime springish 2012 and I plan on using this game as a supplement to our Ancient Roman studies. I’ll be using the text that I read to Supergirl as part of her history studies. If you are studying Ancient Rome and looking for a supplement, I recommend Roman Town. Let me take you on a tour of the game. Roman Town explores ancient Italy through an archeology expedition. As soon as the game loads, you are taken to the Professor’s office to discover that a new site has been found and that the Professor needs some help. You are the new applicant hired to help the Professor. Once you meet the Professor in Italy, the screen takes you the Main Menu. This where you can choose Mini-Games (which are also scattered throughout the levels) or Let’s Dig which takes you to the site. There are six levels numbered using Roman Numerals. Once you complete each level (each level is a room in a Roman house) a picture of the room with the Latin name for the room appears.. Click on the Let’s Dig! button to start. Once you have uncovered all the artifacts you must sort them and then analyze them. Each level has 3 to 4 mini-games that you play to analyze the artifact. 2D Reconstruction--- reconstruct a 2D object such as a mosaic or fresco. Click on the fragment on the left and drag it to the object outline in the center. You rotate the object by clicking on it. I like this one because I enjoy solving puzzles and both of the reconstruction mini-game types are puzzles. As you analyze the object you can L.E.A.R.N. more and you can use that information to complete the “quizzes” and reports. I’d like to point out that the artifacts and the order the artifacts are found does vary so you can delete your completed game and play again and have a slightly different experience. I would be playing and I would hear “hey I haven’t found that yet!”. I never did find some of the objects that Supergirl did so I’m motivated to start over as new player and see if I get to uncover that artifact. I enjoyed playing the game and my children have enjoyed playing the game. I am looking forward to more Archeology games from Dig-It! Games. Remember that until February 21, 2011 you can use the code TOS2011 to get a discount on the Roman Town Game. Be sure and check out the website for more valuable resources such as a Teacher Manual and some online games! Click on the banner below to read what my fellow Crewmates had to say about Roman Town from Dig-It! Games. I agree with the fat cat Garfield when he says “I hate Mondays.” I know I am not alone. But I especially abominate Mondays when they fall on a Wednesday or Thursday or well any day of the week that is NOT a Monday. What is so bad about a Monday? Well for starters around my house Monday sets the tone for the week. If Monday is too awful, the whole week is just gonna be bad. But, If Monday is too good, then we’re too exhausted and overcome with getting so much done that we accomplish nothing the rest of the week. I think I could list more things that have happened all at once on a Monday but I’ll stop at 7. Basically it comes close to “if anything can go wrong it most likely will all at once and on a Monday. Laundry won’t get done, school won’t get done, dinner doesn’t get cooked” On those days I pray that the rest of the week will get better. What makes a Monday nearly perfect? You get up early and find that you still have some clean clothes in your drawer. After getting dressed you start a load of laundry. ALL the school you planned for the day actually GOT DONE. Dinner had already been planned and you remembered the plan and defrosted! To summarize an exceptionally good, nearly perfect day: All the laundry got done, all the school got done, chores actually got done and dinner was home cooked. These are precious days but we’ve learned that if we expend so much energy on a Monday like this there isn’t any energy left for the rest of the week and not much at all will get done on Tuesday. My oldest will breathe a sigh of relief when we have a truly good (but not exceptionally good, nearly perfect day). A truly good day will set a positive path for the rest of the week. A good day means we got some laundry done. Maybe it didn’t all get folded. It means we got some school done but maybe an assignment here or there still needs to be finished. It also means that we had dinner. Usually a simple one and usually not fixed by mom because she’s finishing up school with somebody. But I’d still like to lodge a complaint against Monday when Monday in its ugly form rears its head on a different day of the week. Yesterday was a Monday. I know, I know, the calendar said it was Wednesday but it sure felt like a bad Monday. Last week a new vendor list posted and I was thrilled to see my name on the list. So I was expecting a package…. just not today. But getting the package early wasn’t really the unexpected blessing. Seeing Supergirl’s face when she realized that the package was for HER. That was the unexpected blessing. I wish I had taken a picture or had a recording device for her voice. She wants so much to be like her sisters and so much of what they do for school is well beyond her level of learning. What a thrill to have a review crew product arrive that was just for her! She turned to me and asked “You bought it?”. “Nope.” I explained that it was a crew product that we need to review and that her job was to use the product so that I could write about it on my blog. Her face beamed with pride. This means she is very important. It’s her *job* to learn Latin. She must be mama’s helper. Now, I just have to convince her to wait a day or so to start so that I can look through the teacher book! Since today is February 1st, I thought I’d post a bit about CHD. CHD is Congenital Heart Disease or sometimes Congenital Heart Defects. CHD is the leading cause of infant mortality in the United States. My life has always been touched by CHD, but I wasn’t really aware of it until my daughter was born with Hypoplastic Left Heart Syndrome (HLHS). My Aunt Lynda is a miracle baby. Born in 1949 with Tetrology of Fallot, she was given the gift of life through an experimental surgery. My brother also has CHD. My aunt was my aunt and my brother was my brother and though I was vaguely aware of “heart problems” I can’t say that it really affected my life. But 13 years and 6 months ago my world was torn apart by the news that my newborn daughter entered the world with multiple heart defects. Some of these defects together are known as Hypoplastic Left Heart Syndrome. Some of her defects are rarely seen as part of that syndrome. We were told that without surgery she *would* die. With surgery, she still only had a 50% chance of surviving. We were also told that *if* she survived the surgery, she would have to have two more surgeries and *if* she survived those her odds of living to age 5 would be 50%. For her year group, 65% of the HLHS babies born in 1997 survived to age 5. I wonder, but haven’t been able to find out, how many of that 65% are still alive. Her current prognosis is unknown. We have no idea what her expected life span will be. The last time I checked, the oldest surviving HLHS babies were college age. Today I’ll hold her close and remember all the other CHD babies that didn’t survive and I’ll pray for those babies who are currently fighting for their lives. I don’t know what her future holds, but today she is very stable and doing well. God knows her future and I rest in Him.